It’s funny how a new year has just begun, but important and endless things are worrying so many minds: the final year. I see how students are rushing with their projects/dissertations, trying their best to make a good impression, to be recognised by their efforts and getting the so valuable diploma. Nonetheless, their worries do not end there. Nor mine did. Fascinating questions, I must say, but so terribly uncomfortable, most of the time, to answer. For some, following to the next level of education seems unavoidable: but exactly which one? For others, business or industry lie on the table: but am I ready? Do I have the right curriculum for that position? Fortunately, our University offers great support in terms of careers advice and business startup. If you are starting to struggle with these questions, have a quick look on the Purple Door website. Even if you want to add some work experience, volunteering or find a part-time job, you’ll find plenty of information over there. Nonetheless, my experience says you must be proactive when it comes to finding other options after your undergrad. Not all of us have the same expectation about the future. Some are keen on experiencing the job market, to experience some hands-on work and contribute with what they have learned. If you are one of those, you should seek some guidance from supervisors from each school in order to ask for some useful information. 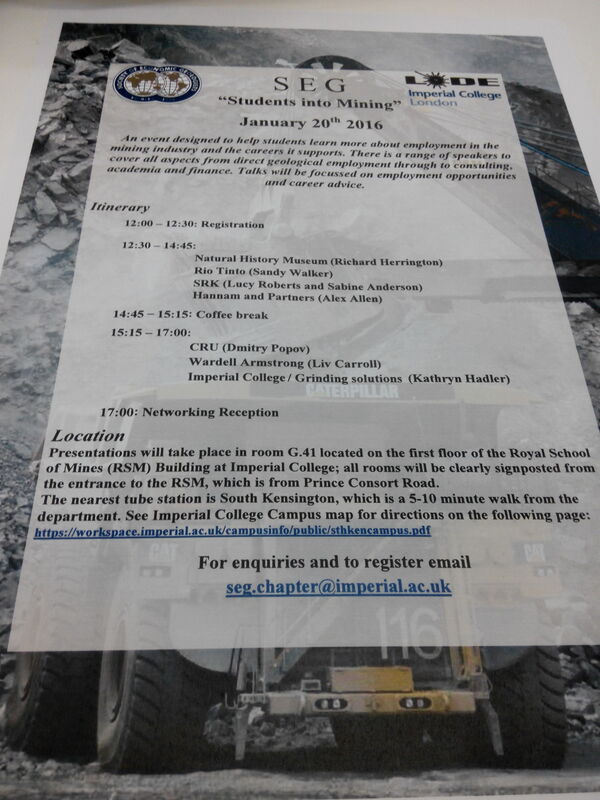 For instance, in the School of Earth and Environmental Sciences a group of students applied for the Society of Economic Geology Student Chapter, which is a wider organisation, and now and then they invite people from the industry to come and have a say of what it is needed from young geologists or how the market has been for the past years. Following these initiatives, they organized a trip to the Imperial College of London for a General Meeting of the SEG. Loads of things were discussed over there, as the UK and EU strategy concerning vital metals and ore exploration, scholarships and jobs opportunities related with the H2020. Several employers from different companies came to have a say about their experience and how they got there. It was a good “wake-up call” for those students wanting to pursue a mining career but still had some doubts and concerns of ‘where’ and ‘what to do’. 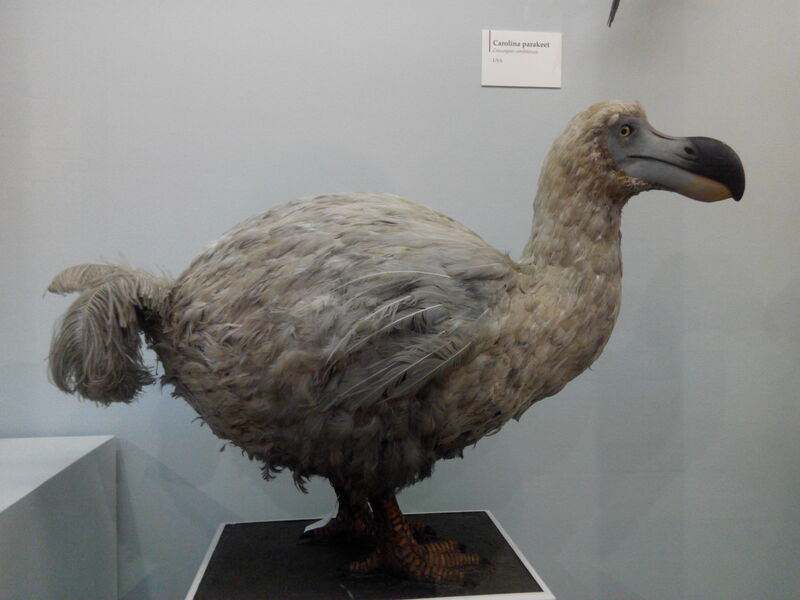 Since the Natural History Museum is so close to the Imperial College, we went there for a quick peek – Dodo, picturing as the extinct bird endemic from Madagascar. I’m positive several other initiatives like this one are and will happen around the UK and most certainly at the University as well. If not, do encourage your lecturers to do so. As for those of you thinking on masters/PhD degree, the University of Portsmouth has a good range of courses, each year is improving its offer, and several students, after it, have been employed. 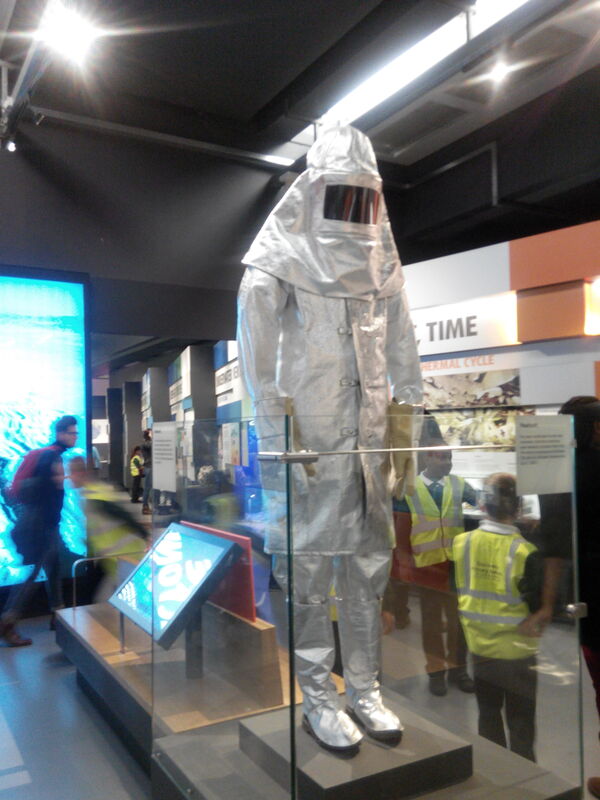 You have MA/MSc and MRes, usually the first takes 2 years to complete while the later is a full-year only researching. You can book a place to be part of the open day, where clarifications of this sort and much thoroughly are given – Open Day Masters. 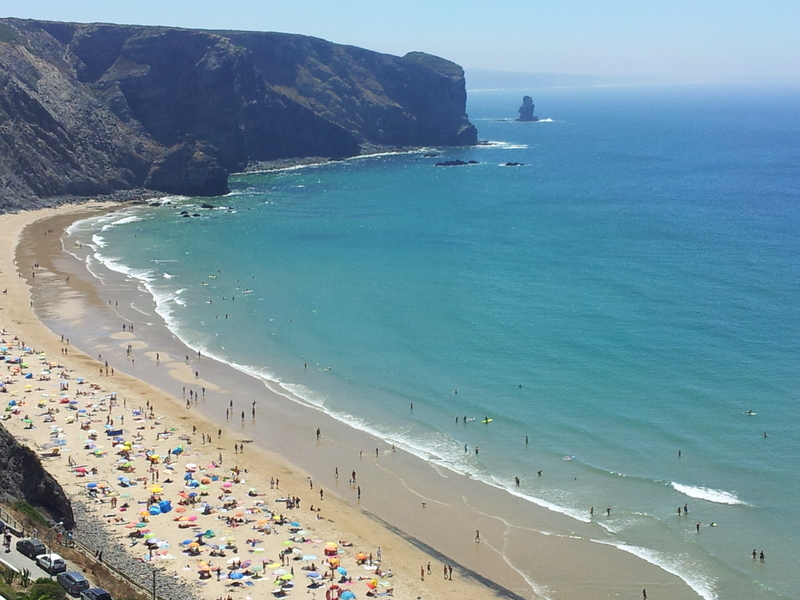 As my personal view, I do think going abroad should be on your to-consider-list. It does look good on your CV, it is much more than just living by yourself (you might have already done that yet), and it is not only partying (if that passed through your mind!). Going abroad can also be less expensive. Considering the living costs of the UK and the fees of a postgraduate course, considering living in an EU country is not completely nuts. Even if the rank of the University is not as high as the University of Portsmouth or other institution in the UK, having a diploma from a different country (though do check its eligibility outside the country) means lots of things that the person who is checking your CV will perceive: means learning a new language, adapting and adjusting to a foreign culture, practising much more social and communication skills, enduring hard situations, experiencing different views and ways of work. You can have a quick look on the top European Universities here. You can search by country or by ranking. You can still have this experience and be in a UK University. Just check the ERASMUS+ website and do a little research on the requirements and choices you may have. You can also apply to a fund, that can help you out during your ERASMUS. With a quick search, you can have an idea of which countries in Europe have more attractive living costs, accessing Numbeo. I would recommend (obviously!) Portugal, Spain or France as possible destinations. These are countries that speak the most spoken languages in the world (apart from English and Mandarin), with welcoming people (increasing towards the SW) and depending upon the subjects with recognized education systems and research. Just be aware that they don’t always have information written in English. That’s easily overcome by sending an email to one or more lecturers of the School you fancy. They can give you all the tips you need. Times are getting harder for everyone. The economy is not so good, the Market’s trust is not as good and therefore, job opportunities and vacancies in Academia are getting reduced. Of course, now and then, mostly due to EU funding, there is still some places and scholarships. If you don’t mind internationalization, some countries are developing and would appreciate young brilliant minds working for them. But don’t be surprised if you don’t find the perfect job right away or if it doesn’t match your expectations, seldom they don’t. With time, patience and dedication you will get there. 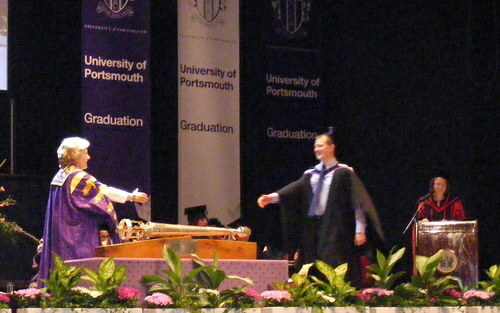 I write to you now as a graduate of American Studies from the University of Portsmouth. What an amazing achievement that is; I am very proud of myself. I graduated on Tuesday 15th July 2014. It was a beautifully sunny day, and I’m pleased the weather remained that way for the rest of the graduation ceremonies. Many pictures were taken of me in the Guildhall Square and Victoria Park by my mother, father, sister and girlfriend who accompanied me on the day. About 2pm we walked into the Guildhall; guests were seated on one side of the hall, while graduands* were seated separately. *a graduand is someone who is about to receive their degree. The ceremony opened as the University mace was carried with great grandeur into the hall. The Vice-Chancellor made an opening speech. Rows of us were ushered backstage, then began the march of students across the stage. I felt very nervous as we queued and slowly edged closer to the stage. All of a sudden it was my turn. Dr Ann Mater called my name. For a moment I didn’t think I could move, but suddenly my legs kicked in and my body was drawn as if by some kind of magnetism, towards Sandi Toksvig’s outstretched arm. I couldn’t believe that for a minute moment I was smiling and shaking hands with the famous broadcaster, our University’s Chancellor. I continued walking back around the stage, then took my seat as the ceremony proceeded. I’m not sure how they can get through so many people in such a short space of time! I felt a great sense of pride sitting with my successful coursemates in our fancy black and purple gowns. Once all the graduates had been confirmed, Sandi made a very funny and empowering speech which really made me feel positive for my future life after Portsmouth. The academic staff, in their own colourful robes, left the auditorium smiling. Then the guests and graduates proceeded outside. More photos were taken amongst much throwing of tasselled caps, and I was pleased to see a few more friendly faces outside. After my robes and hat were returned, I headed out for a celebratory meal of South American food at ChimiChanga, which I thought was a fitting end to the day. Overall, it was an amazing day, and the warm weather made it all the better. I always thought it seemed a bit silly, all these people prancing around in stuffy gowns, yet there was a real sense of relief and achievement on the day; a feeling of final closure. My fleeting seconds on stage are a blur to me now, so I’m pleased that all the ceremonies can be seen again online. On Saturday 19th July I attended the Graduation Ball, held at the Students Union. Still the weather held out for us. I particularly enjoyed the classy live music, group photo booth, shisha, food stalls, bars, face painting, silent disco and club room. It was another amazing night of celebration, and a chance to say goodbye to my classmates on an informal basis. After six hours of partying my feet had given in, meaning I didn’t make the survivors photo at 5am. Nonetheless, what a memorable night it was! There’s not much more to say now. After three years of hard work, I felt the graduation day was well earned. It’s a day which will stick in my mind forever. My graduation took place on Thursday, 25th July, and was the last graduation of the year. It was a very important and exciting day, mainly because my grandparents travelled over 1000 miles to see me graduate, and it meant the world to me to have them there. I was really impressed with the graduation ceremony. After collecting and putting on our robes (which look even fancier in real life!) we made our way to the Guildhall square and spent some time catching up with course mates and taking photos. When the time came, we entered Guildhall through a student only entrance, sat down in our assigned seats and waited for the ceremony to start. It started with the Vice-Chancellor and departments’ representatives entering the Guildhall. The Vice-Chancellor then opened the ceremony with a short speech and following that, the presentation of degrees and graduates began. We were required to quietly leave the Guildhall and make our way backstage to prepare for our appearance on stage. We queued in line, waiting for our turn while the graduation assistants adjusted our robes and checked the order in which we were standing. They checked the order at least 3 times with the last check right by the edge of the stage. I have to say, waiting backstage is kind of nerve wrecking. All I could think about was that I could not embarrass myself by tripping, or falling, or dropping my hat, or having my hood slide off… in front of everyone in Guildhall (and everyone outside, watching me on the big screen, AND everyone watching online. No pressure, right?) The tripping part was especially important for girls, as majority of us wore high heels. The good news is: no one tripped! Some people even did little victory dances! It felt very good to get out there and be congratulated in front of so many people for our hard work and effort over the past three years. I was proud of myself and all my course mates. The ceremony ended with closing speech from the Vice-Chancellor and a short video from the Chancellor Sandi Toksvig (who unfortunately could not be with us on that day due to work commitments). After we exited Guildhall, our entire department gathered around on Guildhall steps to take a final photo. Afterwards, there was time for final goodbyes and even more photos. This was definitely the saddest part of the day – realising that our University experience is officially over. What is awaiting us right now, is the real life out there. The life of grown ups, with full time jobs and council tax to pay. But we will be okay.